Historical foundations of a modern company: The following outline highlights more than 140 years of BASF coporate history. The first stage of German industrialization begins in 1835 with the building of the first German railway. At around the same time, customs barriers between the individual German states are abolished. At the turn of the century, the British chemist Sir William Crookes delivers a lecture to the British Association for the Advancement of Science in Bristol titled "The Wheat Problem." After the First World War, the situation for the population in Germany is alarming: The Kaiser has abdicated and the economic outlook is dire. Reparations, the dismantling of factories, a scarcity of coal and inflation prevent economic recovery. The post-war years are marked by streams of refugees, a shortage of housing and unemployment. City centers, residential areas and industrial plants lie in ruins. Germany's economic boom continues until the mid-1960s, but in 1967 the country slides into recession for the first time. Gross domestic product drops by 0.2 percent instead of rising 8 percent per year as it had done until now. BASF A/S is a wholly-owned subsidiary of BASF SE, Ludwigshafen, Germany. The company is an active partner to the industry and sells approximately 3 000 products from BASF's wide product range as well as supplementary products from a number of other suppliers. Our most important customers are to be found within the industry for plastics, chemicals, construction and building as well as the automotive industry and in the agricultural sector. 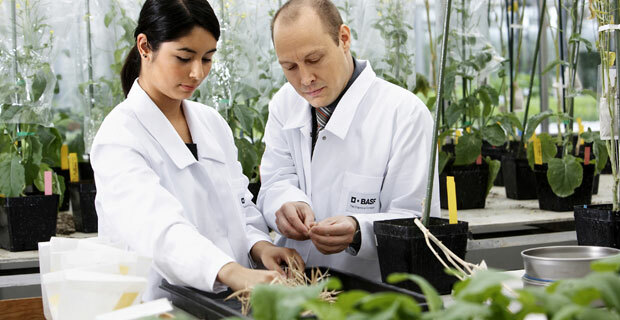 We represent the connecting part between the industry in our region and the competence within science and technology acquired by the BASF group during many years in close co-operation with customers all over the world. BASF A/S works in close cooperation with the other BASF companies all over Europe. Among the synergy effects of a pan-European organization are the benefits we can draw from each other's know-how and special products. Our production site in Ballerup was founded in 1920 and has over the years through constant innovations created a proces of manufacture which is quite unique. The Ballerup manufacturing site is specialized in microencapsulated formulations mainly for the beverage, food and pharmaceutical industries of vitamins A, E, D, K, B, carotenoids, polyunsaturated fatty acids, aromatics and dyes. BASF aims to strengthen its position as the world’s leading chemical company. We describe how we intend to achieve this in our “We create chemistry” strategy. In 2050, around nine billion people will live on this planet. On the one hand, this population growth is associated with enormous global challenges but we also see many opportunities, especially for the chemical industry. We expect the chemical industry to grow particularly strongly in the emerging economies, and that these markets will account for around 60% of global chemical production by 2020. Dramatically rising energy demand is one of the world’s most pressing challenges. In addition, access to clean water and other non-renewable resources is becoming increasingly important. A growing world population obviously needs correspondingly more food. And it will be necessary to enhance nutrition quality. Population growth and globalization present further challenges. Aspirations differ greatly from region to region and among different social groups, but there is a common ambition: people want to improve their individual quality of life. In developing the “We create chemistry” strategy, we have also defined our values more precisely. It is important that each and every member of the BASF team understands our corporate values and acts accordingly. This is because our values are an integral part of bringing our purpose as a company to life: “We create chemistry for a sustainable future.” They guide how we interact with society, with our partners and with each other. In order to find innovative and sustainable solutions, we have the courage to pursue bold ideas. We bring together our knowhow in many different fields and build partnerships to develop creative, value-adding solutions. We also constantly work to improve our products, services and solutions. We value diversity – in people, opinions and experience. That is why we foster dialog based on honesty, respect and mutual trust. We continually explore our talents and capabilities. We act responsibly as an integral part of society, strictly adhering to our compliance standards. And we never compromise on safety. We all contribute to BASF’s success, as individuals and as a team. BASF turns market needs into customer solutions. We succeed in this because we take ownership and embrace accountability for our work. We always focus our business to the needs of our customers. Since January 1, 2008 there have been six segments, which are based on related products, customer industries and production processes. This will enable us to more effectively combine our competencies and knowledge and bring our products and system solutions faster to market. In addition, our investors will be better able to assess BASF. The Chemicals segment consists of the Inorganics, Petrochemicals and Intermediates divisions. At our integrated production facilities - our Verbund - in Europe, Asia and North America we produce a broad range of basic chemicals and higher value products for our internal and external customers. BASF is one of the world’s leading producers of plastics. The Performance Polymers and Polyurethanes divisions offer our customers energy-efficient products, system solutions and services. The Performance Products segment comprises the Dispersions & Pigments, Care Chemicals, Paper Chemicals and Performance Chemicals divisions with effect from April 1, 2009. These divisions develop performance products that make our customers’ processes and final products more efficient and competitive. The businesses acquired with Ciba will be integrated into the relevant parts of the segment in the second half of 2009. The Functional Solutions segment consists of the Catalysts, Construction Chemicals and Coatings divisions. These divisions develop innovative, sector and customer- specific products and system solutions, in particular for the automotive and construction industries. The Agricultural Solutions segment consists of the Crop Protection division. We develop and produce innovative active ingredients and formulations for the improvement of crop quality and yields, and market them worldwide. BASF’s oil and gas activities are bundled in the Wintershall Group. Wintershall and its subsidiaries operate in the business sectors Exploration & Production and Natural Gas Trading. Across all industries, customers expect solutions that help improve quality, increase comfort and reduce energy consumption. As an innovative partner we offer considerably more than just high-value products: We support our customers in facing a multitude of challenges and offer them tailor-made solutions. The BASF group is the largest chemical company in the world. Our business partners all over the globe refer to us as 'The Chemical Company'. Our portfolio ranges from chemicals, plastics, performance chemicals, agricultural and functional solutions to crude oil and natural gas. When it comes to using resources efficiently, the 'Verbund' is one of BASF's greatest strengths and therefore a key competitive factor for us. It also helps to protect the environment. In short: BASF is a true global player with a lot to offer. Our employees work together to develop innovative solutions and leading-edge concepts. It is their creativity and passion that ensure global progress and our leading position in the industry. Whether you have just finished school or university, or have already been in the working world - BASF is looking forward to getting to know you. Although we have about 97,000 employees worldwide, you will be recognized for your individual contributions. We promote our employees actively and individually – from the very first day. By answering tomorrow’s questions today, we can still be successful the day after tomorrow and further out into the future. So the task is to develop trendsetting technologies, set the benchmark for scientific research, and consolidate our position as the industry leader. If those are your drivers as well, why not join us as part of our international team? Plant and machinery construction is a highly skilled area of engineering: we put together teams of experts from the areas of process engineering, chemistry and bioengineering, mechanical engineering, and electrical and automation engineering for the construction of production plants all around the world – respecting the highest safety and environmental protection standards. That’s how we maintain our position as the technology leader. Does that sort of challenge appeal to you? BASF’s name is synonymous with high-quality products in the chemical industry – and for the infrastructure needed to translate that into success in the world market. Accordingly, BASF offers exciting entry and further development opportunities in areas such as purchasing or logistics, financial accounting, controlling, marketing, human resources, our legal department, or public relations. As well as being the world’s leading chemical company, BASF can offer a wealth of exciting jobs and career opportunities. Our staff enjoy a comprehensive range of personal and professional development options. We will work with you to identify and develop your particular talents. Our approach is to create the best possible team, as the springboard for achieving ambitious targets and ensuring the company’s ongoing viability and success. To find your ideal role within that team, we will focus on identifying your particular interests and skills. We will then be able to offer you appropriate options for professional development and further training. This includes customized learning and development programs and an extensive range of seminars and self-study opportunities, including e-learning applications. BASF will be able to offer you a career path tailored to your needs in either a technical or a management role. Juggling job and home commitments? - No problem at BASF! And to keep our people at the top of their game, we believe in providing a healthy work-life balance – because we know that motivation and success at work and in private life depend on a harmonious combination of these two spheres. Some of our locations provide in-house daycare centers to make it easier for staff with children to juggle their workplace and family commitments successfully. BASF also uses mobile work arrangements and flexible working hours, and provides a rich and varied program of cultural and sports activities for its employees. We are serious about health insurance and retirement savings: BASF actively encourages its employees to adopt a healthy lifestyle, for example by helping them to quit smoking, or by offering tips on healthy eating and a balanced diet. You can take part in some of the many sports activities throughout the company – or how about a yoga session after work? And with our employer contributions to BASF pension plans, we help you to plan a long and happy retirement. Innovation or tradition? A dynamic working environment or stability? Rather than focusing on one or the other, BASF lets you combine both ends of the spectrum. We value diversity and a lively exchange of opinions and ideas among our employees. Our people bond in much the same way as chemical elements and molecules. As an international company we embrace our responsibilities for the world we live in. This is ingrained through our corporate policy on sustainability. We work diligently to harmonize the company's success with the protection of the environment and our responsibility to society. Through this commitment, BASF contributes to improving life for future generations. A world full of opportunities: BASF offers students many chances for complementing their theoretical routine with practical experience. As the world's largest chemical company we operate internationally and our more junior employees benefit from a practically limitless range of opportunities. Whether you would like to work in Research & Development, in Engineering & Production or in a Business & Corporate function - there is a place for you at BASF. Join the efforts of BASF's brightest minds from an array of different fields and contribute to the success of the company. How about getting a job in your vacation period or in the course of your vocational training? An internship at BASF teaches you a lot about the work flow of a globally operating company. With us, you can learn from some of the best in their trade and open the way to a career-building experience. If you have considered writing your bachelor, diploma or master thesis at BASF, you will quickly find many practical examples for your chosen topic. We will provide you with advice and support all through your research project. By the way, whichever career you would like to embark on at BASF, you will benefit from the personal support given by our competent experts. They invite you to watch them at work and will gladly answer any question you may have. If this is the kind of opportunity you are looking for, we encourage you to submit your application! Internationally oriented with a wide range of business units: this unique type of enterprise makes BASF an attractive employer for university graduates as well as other emerging employees from various fields of occupation. As a global player, we offer you the very best opportunities for a perfect start to your career. Whether you would like to work in Research & Development, in Engineering & Production or in a Business & Corporate function: BASF is a stronghold of talented individuals with passionate personalities. Contribute your professional excellence into a team of like-minded people! Work together with your colleagues from all around the world and from thousands of specialties to find solutions to the problems of tomorrow. Help to make something good even better! Your development is important to us. BASF offers you the very best chances to develop your professional skills at the start of your career. There are specific programs to develop and retain the next generations of leaders and experts. And you can enlarge your horizon by taking language courses or when working side by side with experienced experts. Fascinating fields of occupation und demanding tasks: BASF offers optimum working conditions for qualified workers, experts and executives. Whether you are an application engineer, a sales expert, a finance specialist, a laboratory technician, or a top cook - in our company, the very best of their trade work together on our common success. Come and join the world's largest chemical company! At BASF, you don't just have a job - you have a vocation. The members of our international teams work together with enthusiasm and dedication to achieve common success. They enjoy doing their jobs and are committed to their work. We are particularly interested in helping them develop their skills. The wide range of know-how among the employees at BASF enables them to learn from each other. But we also offer our qualified personnel the chance to extend their competence by special programs. Our 'Professional Development Program' (PDP) in the United States of America for instance includes special qualifications in the fields of finance and chemistry as well as MBA courses. What do you need to join BASF as a qualified employee? Basically, it is your expertise and your years of experience that count. If, on top of that, you are also a good team player with a personality of your own, you have the very best prerequisites for your success at BASF. Let your application convince us!